By making a stunningly simple alteration to fishing gear used extensively in the Caribbean and tropical waters around the world, the research of a Scripps Institution of Oceanography at UC San Diego graduate student could have monumental implications for the sustainability of coral reef fishing practices. As described in a research paper published in the September 29 issue ofMarine Ecology Progress Series, Scripps student Ayana Johnson worked in the southern Caribbean island of Curaçao. designing and testing small escape gaps in coral reef fish traps. The openings were small enough to keep large, high-market value fish within the confines of the traps, but led to a dramatic reduction in bycatch, the smaller fish caught incidentally that have little or no economic value. 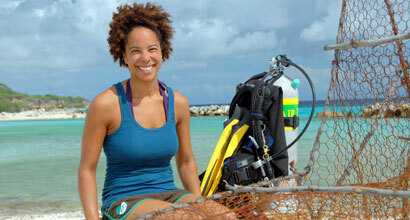 Johnson, who has been discussing the possibility of implementing escape gap modification with coral reef fishery contacts elsewhere in the Caribbean as well as Africa, said the idea of escape gaps in coral reef traps is not new, but her research in Curaçao was the first scientific test implemented on a large scale that considered both the ecological and economic implications of requiring escape gap use. Johnson deployed a total of 24 traps at three shallow reef sites off Curaçao. She compared traditional traps with no alterations to traps modified with escape gaps of varying sizes. The study demonstrated that traps with escape gaps—rectangular openings made of rebar woven into the mesh netting of the traps—of both short and tall heights caught significantly less bycatch because narrow-bodied species and juvenile fish managed to swim free. it's a simple idea that could have a big impact on reef fish conservation, without impacting fishermen’s incomes,” said Johnson, a Ph.D. student in the Scripps Center for Marine Biodiversity and Conservation. Escape gaps could hold several important ecological and economic benefits, according to Johnson’s paper, including healthier reefs as a result of more fish available to keep destructive algae growth in check; a reduced number of juvenile fish caught, leading to a larger number of reproductively mature fish and an overall healthier fish population; and additional tourist interest as a result of increased species diversity, a key attraction for recreational divers. “Escape gaps have great potential to benefit both fishermen and conservation, and requiring escape gaps in all reef environments where traps are used would represent an important step towards sustainable management,” Johnson wrote in the paper.